John Doyle's revival moves The Cradle Will Rock, this Works Progress Administration-sponsored period piece out of the shadows to remind us that the issues of 1937 are still challenging in the 21st century. Using a minimalist approach to the staging Doyle, with assistant scenic design David L.Arsenault, brings a fluid sense of time and setting. We are in Steeltown USA--owned and operated by the sinister tycoon Mr. Mister (David Garrison). On the brink of a big unionizing vote, we sit just out of earshot of the rally. Here the respectable townspeople, members of a citizens' committee, are protesting rabble-rousing! But these anti-unionists have mistakenly been hauled off to jail together with the local streetwalker and the town drunk. As they wait for their benefactor, Mr. Mister, to right this cruel mistake, we are given glimpses of the lives of these respectable citizens. We see how they have been shaped and compromised by the over-arching power of the company. With a cast of ten players, Blitzstein's musical comes alive. Musical Supervisor Greg Jarret incorporates the piano into the scene, and actors Ken Barnett, Ian Lowe, Kara Mikula and Benjamin Eakley provide the piano accompaniment to the songs. The Moll, (Lara Pulver), and Hammer, (Rema Webb) have meaningful voices which lend poignancy to their tunes. Dance, and movement by Eddie Cooper and Kara Mikula in their portrayal of the idle rich-kids, children of Mr. and Mrs. Mister, is most notable. They are at once graceful, humorous, and engaging. Tony Zazbeck is compelling as both the emotionally broken druggist and the union organizer. Costuming (Amy Price) is minimal, but enhances the uniformity, steely grayness and the bleakness which is Steeltown. The play turns on the irony of the disreputable prostitution of The Moll and the respectable sale of their honor by the respectable members of society who have sold themselves to 'big business'. Rev. Salivation (Benjamin Eakley) preaches peace when it is good for the steel business and war when war sells steel. Dr. Specialist (Eddie Cooper) doesn't mind falsifying death records to cover for industrial accidents. The Artist and Musician (Rema Webb), would rather make money than be truthful. Mr. Daily, the newspaper owner, (Ken Barnet) prints only all the news that fits the steel company's interests. Money is what talks and Mr. Mister distributes a great deal. Mrs. Mister, (Sally Ann Triplet) with a mincing walk and smarmy tone, is often the conduit for the business of buying allegiances. In our own era of big business's questionable hold on some of our elected officials, and the daily reports of payoffs and payouts for a variety of questionable favors, we cannot help but reflect on the dichotomies of Steeltown. As the workers in the steel mills unionize and unite to demand a living wage, the respectable citizens are forced to look at their own terms of employment. Who owns the property that is mortgaged to the steel company? Who owns the medical practice that depends on extralegal services rendered? Who is the editor when the news is selected by the steel company? Is middle-class respectability purchased at a cost? This is not a play about doom and gloom. 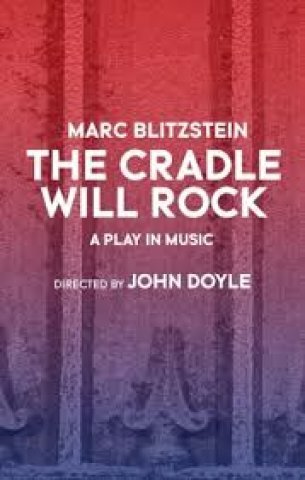 The Cradle Will Rock is a lively revival that reminds us that when the winds of change begin to blow, they rock us all.